The city of Addison is on pace for rapid growth. It has flourishes with many successful events attracting 650,000 people annually. Taste Addison, Addison Kaboom Town, Summer Series, Oktoberfest, Vitruvian Lights, and Vitruvian Nights Live keep the city fun. These festivals usually attract young couples to Addison. We began working on this blog series to help connect couples with their dream venues. Our list of Top 4 Addison Indian Wedding Venues benefits each couple that wants an amazing wedding weekend. The list is expanded to include hotels near Addison. When coming up with this list we thought about events that are part of many Indian Weddings (Hindu, Muslim, Christian and Sikh). Pre-wedding celebrations such as the Garba, Sangeet, and Mehndi nights can be held in the smaller ballrooms, there is a clear path for baraats, and the larger ballrooms are spacious enough for the traditional big fat Indian wedding. Each ballroom at the previously named Intercontinental Dallas now named Renaissance Addison has its own feel and atmosphere. The layout of all the ballrooms has a very individualistic design and you can see how the structures are made out to perfection. This is one of the most popular Addison Indian Wedding Venues. Lalique is one of their new ballrooms thats is great for Sangeets. Most of the large reception take place in Crystal Ballroom. Small receptions usually opt for Malachite ballroom. Garden Court is perfect for wedding ceremonies. It gives you that outdoor feel while playing it safe with Texas unpredictable weather. Check out how great Tilu & Eric's reception was inside the Crystal ballroom at the Renaissance Addison. This fun Malayalam couple wanted us to keep the dance floor full all night. The lights, music and energy all made it possible. This hotel is attached to the Galleria Dallas. With its’ elaborate ballrooms you will leave your guests mesmerized. The ballroom is a view itself. The area provided with each room makes sure there is plenty of space for an epic dance floor. The biggest ballroom is Dallas, followed by Fort Worth. There is a space, San Antonio, next to the pool thats indoor but has large windows which is great for ceremonies. If you have a lot of out of town guests, this Addison Indian Wedding Venues a great place to keep them entertained with the mall when they aren't busy with wedding weekend events. Check out Omar and Zaneb's valima in the Dallas Ballroom. When the groom pulls up in a Lamborghini, the rest of the night has to be classy and fun. The newly renovated hotel has ballrooms that provide a flexible space with beautiful high ceilings. The fresh designs of each ballroom are head turning. Elevate is located on the 20th floor. Nice open feeling with a view. Great for sangeet night. Most wedding and receptions take place in the Grand Ballroom. We added this hotel into the Addison Indian Wedding Venues list because its near Addison and popular for Indian weddings. Here are the highlights from Stephie and Tony's reception at the Westin Park Central. We loved being a part of their amazing reception and loved how much they wanted to party. It is important to not only balance out the cultural aspects of the reception but also do everything you and your guests will enjoy. Simplistic designs of the ballrooms gives couples more options to modify their décor and lighting preferences for their weddings. A fresh and clean venue added to your dream wedding ideas can bring a brilliant design to life. Marriott Quorum makes the list of Addison Indian Wedding Venues because of its staff and location. Find it very close to Dallas North Tollway and Belt line road. Spring of 2018, we will be back there again, and update the blog after that with video of our setup. Until then, enjoy this wedding which we were not a part of. Your wedding is the happiest moment in your life therefore choose a venue you love and the right vendors that will help make your special moment a time you’ll never forget. 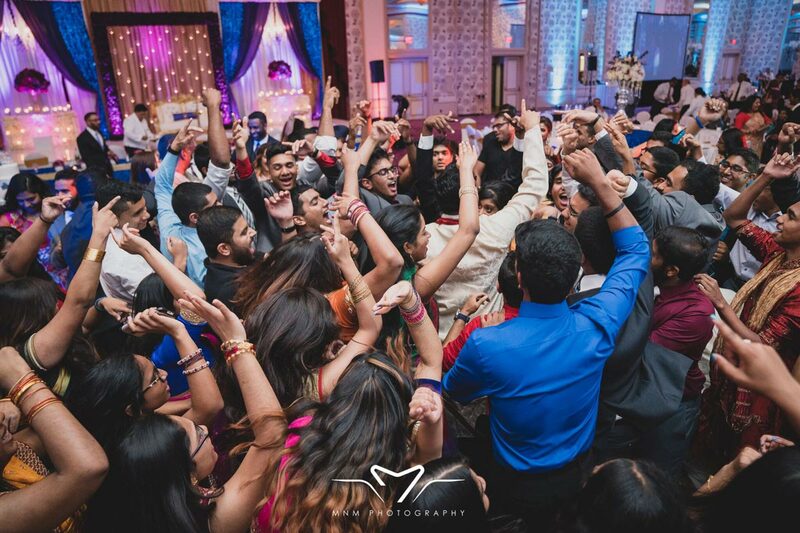 Over our 23 years of bringing joy to thousands of couples, the DJ Riz Entertainment team performed many times at all of these Addison Indian Wedding Venues and can ensure you will have the time of your lives. Given these points, if you would like to talk about which venue we think is best for you or want more information on our services, contact us here.